Some disciplines list hundreds of authors, which makes it impossible to distinguish role or seniority and which areas they contributed to. In this example, the increasing complexity of high-energy physics is leading to ever increasing author fields, which may include engineers and technicians as well as research scientists. The list of authors attached to a paper has provided a comfortable device for apportioning attribution for centuries. Not only is it simple and clear, we all have a good idea of what "authoring" implies. However, with the increasing migration of content to an online environment, the number of ways in which papers can be connected has exploded. We expect references and citations to click through, we want to see what else authors have written, and we are keen to discover who they have collaborated with. But while this connectivity establishes that there is a link between an author and a paper, it says nothing about the nature of that link. Did the author write the experiment or analyze the data? Or were they responsible for running the research program — i.e., had very little to do with this particular article? There are many ways one can contribute to a research project, from designing the experiment to writing the funding proposal or acquiring subjects and data, as can been seen in Figure 2. Depending on your field, you may be thinking about the order in which the authors are assembled, and how you can use this to make sense of their relative status. However, a researcher in another field may interpret that same list quite differently. This is illustrated in Figure 1 below, in which we take a look at a fictional paper written by Smith, Taylor and Thorisson. One of the advantages that a reconceptualization of authorship offers us is the proper acknowledgement of work undertaken during the research process without conferring a higher status than is merited. For example, work that is undertaken on computer algorithms would not (at the moment) usually confer authorship by itself. However, a move towards a contributorship model would enable the correct communication of the algorithm creator's contribution. As publishing opens up and platforms become more integrated, we are likely to become more exposed to articles that are outside our field, and others that are interdisciplinary. If we can't rely on the author order to help us make sense of what authorship has meant for a particular paper, can we at least be sure about the class of activity that merits authorship attribution? With the exception of high-energy physics, which will include engineers along with researchers in the authorship list (as in the main image), it's a surprisingly difficult activity to undertake. There is an extensive and growing literature available covering the ethical dilemmas that arise from attribution. "Authorship credit should be based on: 1) substantial contributions to conception and design, acquisition of data, or analysis and interpretation of data; 2) drafting the article or revising it critically for important intellectual content; and 3) final approval of the version to be published. Authors should meet conditions 1, 2, and 3." Do you agree that contributorship is the way forward? Would it work in your field? Please let us know your thoughts by posting your comment below. [/note] Although these rules are clear and many journals are signed up to follow them, there is evidence that compliance is far from complete, and that the rules are not well understood. In fact, exploring alternative models was the focus of the International Workshop on Contributorship and Scholarly Attribution2, hosted by the Institute for Quantitative Social Science (IQSS) at Harvard last May. Those of us with experience in publishing would recognize the issues involved in getting hundreds of authors to give final approval to a document: and some fields have published manuscripts where authorship is well into the thousands. Two phenomena that have become recognized over the last few years are "ghost" authorship and 'guest' authorship. Guest authorship occurs when an author's name is included on the authoring list despite them not having played any part in the research or authoring process. This can come about in a variety of ways: when it is 'normal lab practice' to include the head of the lab on all publications; when a researcher has left the organization before the paper is written; and in the hope that a senior and well-respected name will confer additional credibility on a research paper and improve the chances of publication in a high-impact journal. Ghost authorship is a phenomenon that is said to occur when interested parties employ a professional writer, or have staff members on the research team, but don't include these individuals on the final publications list. The implication is that these people would have a conflict of interest in the outcome of the research (or at least the presentation of the research at publication). By omitting their names, the paper affiliations look more neutral. There is a variety of other literature3 in this area, alleging political/organizational influence in the creation of authorship lists. There is also some evidence that – when computed – tasks that would have previously conferred authorship no longer have this advantage. As publishing articles is frequently considered to be the main currency of academic recognition – and is increasingly included in formal rule sets that govern academic status and eligibility for funding – so we can expect an increase in the heat governing this debate. Potentially, if the number of authors included in an article continues to increase, we may also witness a decrease in the value of authorship. So what about contributorship, and how does it relate to authorship? Authorship is bound to persist into the future, for both ethical and copyright / legal reasons, so contributorship needs to be seen as an extension of existing protocols. In short, the idea behind contributorship is to disclose what activities the researcher undertook to merit a place on the author list. Research undertaken by the author and colleagues in 2012 indicates that nearly all activities can be classified into a set of between 12 and 15 categories. The first three of these are outlined in the table below. Although the prospect of this additional task as a manual activity would – quite properly – concern all people involved in the authoring and publishing process, this work could be a feature of the various research and collaboration tools (e.g.,Mendeley) and services such as ORCID (footnote: ORCID was designed to enable definitions richer than authorship). Relationships are changing; we are moving towards a richer world with a more detailed and nuanced web of connections. Although the concept of authorship is rooted in our culture and in our minds, contributorship could offer a richer set of definitions, enabling our contributions to human knowledge to be recorded more precisely. The value to us will be in knowing the areas of our expertise and contribution. If the cost is ameliorated through intelligent tools and services, then we can expect to see contributorship becoming one of the hot topics in scholarly communications and publishing. 1. International Committee of Medical Journal Editors,Uniform Requirements for Manuscripts submitted to Biomedical Journals: Ethical Considerations in the Conduct and Reporting of Research: Authorship and Contributorship. 2. IWCSA Report (2012). Report on the International Workshop on Contributorship and Scholarly Attribution, May 16, 2012. Harvard University and the Wellcome Trust. [divider] A version of this article originally appeared in Editors' Update. An article on this topic, Fixing authorship – towards a practical model of contributorship, appeared in Elsevier's Research Trends. Thank you, Professor Asadullah, for your informative note, and taking the time to read my article. Good idea, Mike. I added this link to the screenshot. Dr. Selin Şahin worked on extraction of olive tree leaves and optimization of the method. Professor Mohammad Asadullah is a supervisor and Professor Mohammad Sahedur Rahman is a co-supervisor of PhD student Israt Jahan and Masters students Mohammad Boshir Ahmed, Pasilatun Adawiyah and Nur Hanina Malek. Israt Jahan and Mohammad Boshir did experimental works with a guidance of Professor Asadullah and Professor Rahman and Pasilatun Adawiyah and Nur Hanina Malek did analytical works. 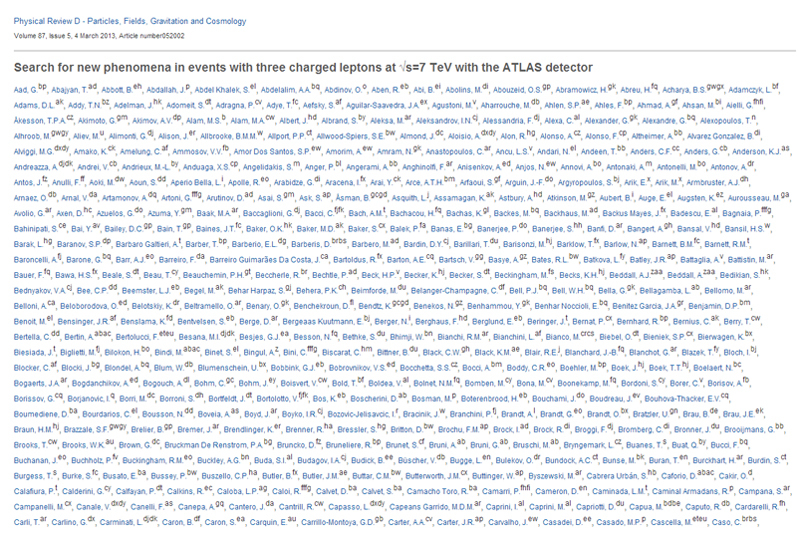 All the authors approved the paper to be published.